We want cooperation. It is so much better to have the cooperation of law enforcement than to be in an adversarial situation with them. This page explains the thinking of a good police officer (can anyone explain how the bad ones think?!) and how to get him or her to support or at least not oppose your freeway blogging peaceful demonstration. It does help to know the law, of course 🙂 And to show the police that you know the law and intend to comply with it and still exercise your Constitutional rights. Use buzzwords that you know police want to hear such as “peaceful demonstration”, “traffic safety” (as in “We are very committed to traffic safety”) and so on. It is possible and smart to show a certain amount of deference to a police officer, like by complying with a direct order and not arguing (because it’s illegal to disobey a cop’s lawful order and even when they give an unlawful order if a person disobeys it, suddenly the focus of the conversation changes from the specifics of the law and its application to the situation to the fact that the cop feels obligated to assert his authority and crack down, leading to bad results all around), and still maintaining your position – that this is a safe and legal activity and you have the intention of doing it. In my opinion the police officer wants to see some cooperation early on in the conversation with the citizen. In his mind there is a fork in the road right at the very beginning of the conversation and he must decide which fork to take: the fork of cracking down on the citizens and generally preventing what they want to do or the fork of cooperation. The right attitude, the right decision and a few well chosen words right at the beginning can cause him to take the fork of cooperation. It’s so important to do that. What he is thinking is, “What kind of encounter is this going to be? Am I going to have to bust their butts or will they show me enough cooperation and compliance with the law and safe behavior that I will be justified in letting them do what they want to do?” That’s exactly what he is thinking. 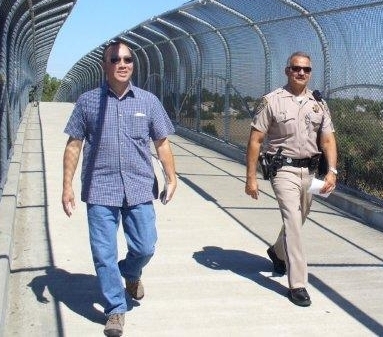 Having the cooperation of the police department and highway patrol by arranging a freeway blogging event 2 or 3 days (or 4) in advance is like having the commanding officer on your side. It’s just perfect. For more information on how to secure this valuable cooperation see our page called Clear your event with the CHP.